Al Snoop called me several years ago about a Pioneer one of his neighbors had. We have a 69 4-speed and a 72 5-speed, so I wasn’t really interested until we saw the paint scheme and realized it was a 68! As you see from the “before” pics, it was pretty rusty and missing quite a few parts. But I like the different paint, low fender, full right-side engine cover. 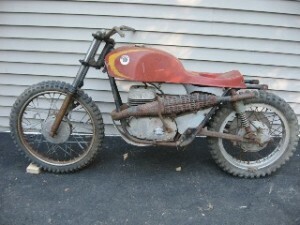 This is a later model – earlier 68s are more like a 67 – different tank, 19” front wheel, “chopped” front fender, etc. This bike was a challenge to restore but we are glad to have it in the collection now!